The CWG-2000 strip/sheet width gauges are designed to measure accurate and contactless the width of various strip/sheet products. The system is based on one or two line cameras, positioned on the edges or in the center of the material. For the width measurement each camera measures the strip/sheet edge relatively to its center line. The width is calculated by the distance between the cameras plus the edge position measured by the left and right positioned cameras. For a better edge resolution a line illumination is placed under each camera. The cameras are automatically positioned by using linear guideways. For smaller dimensions one camera is sufficient to detect both edges. 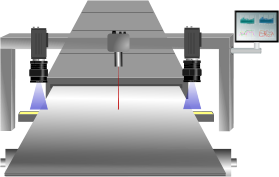 Optionally, a laser-based speed/length measurement sensor may be incorporated into the frame.